It’s not usual for our children to make it into this part of our B&B life, but we had a great family time this weekend! Three years ago, our oldest son discovered running and I decided I had better see what he was so excited about. D’Arcy used to run years ago, but I was never able to find the same enthusiasm. 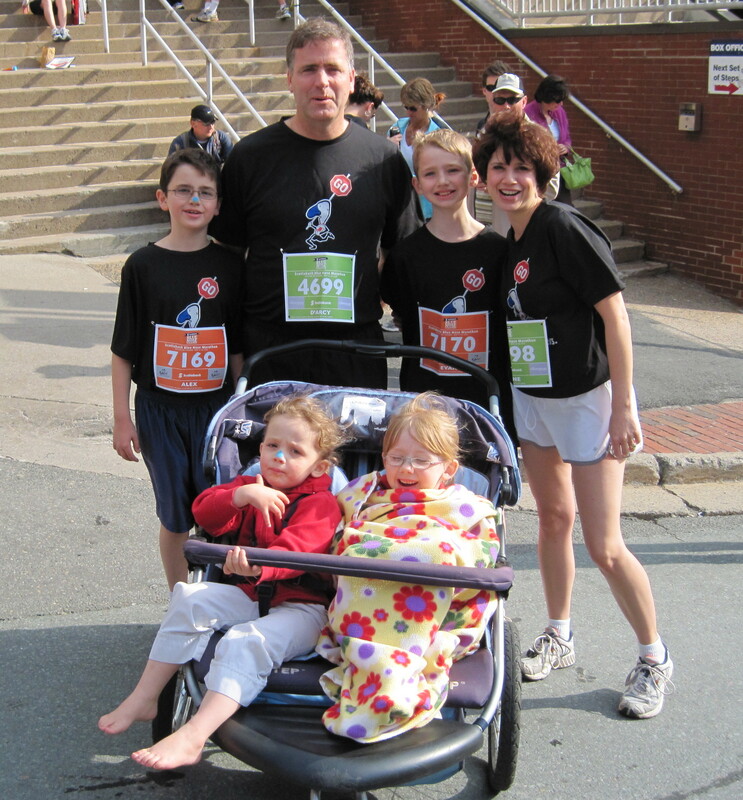 Last year’s Blue Nose 5k was my first time running in a race of any kind. When I finished, D’Arcy commented “Next year we should do the 10” to which I replied, “NEVER!” I don’t consider myself a runner and didn’t think I could ever run 10k! After an extremely busy, tiring, and somewhat stressful week, we took advantage of one of the Delta’s last minute specials and headed to Halifax a night early. It was suppertime before we actually were packed up and on the road, so we stopped off at the grocery store and picked up some items to have a picnic for supper. We ate fruit, nachos, crackers, olives, cheese, yogurt and breadsticks. We watched some of the hockey game and hung out as a family. We encouraged the kids to get to bed early, but I think it was close to 10:30 before we finally had to lay down the law to get them to stop giggling with one another and close their eyes. I took the boys up and dropped them off together at the start of the Youth Run on Saturday while D’Arcy navigated the girls through the crowd to secure a place near the finish. There were apparently 3000+ kids who participated this year, so the crowds were a bit crazy, to say the least! D’Arcy left me there with the girls and he headed up to the water stop along the 4.2 km course to watch for them. When each passed, he would phone to tell me when to look for them. They both ran really well – without stopping – Evan finishing in about 18 minutes and Alex in about 23. After the race was over, we went into the Metro Centre to meet our very pleased and proud boys, which was where we noticed that the girls were featured in last year’s Youth Run Video as it played on the big screen. Sunday, the big race day, dawned bright & beautiful again. All went fairly smoothly getting organized and ready. We met up with D’Arcy’s sister Erin as planned (She had agreed to stay and run the 5k with Evan & Alex while we ran the 10k. She ran the Sugarloaf Marathon last week and is running the Cabot Trail Relay next week, so 5k was a good break for her! We got our chips on our sneakers and our bibs on our shirts and headed up to the starting line. Of course, as I got my camera out so we could have some photos for posterity, the batteries died! (Never fails!) What did we ever do before phones with cameras? Mine saved the day! We all headed up to the start and watched the full marathon runners take off. We said our goodbyes, good lucks and have funs and left for the start after getting hugs and high-fives. 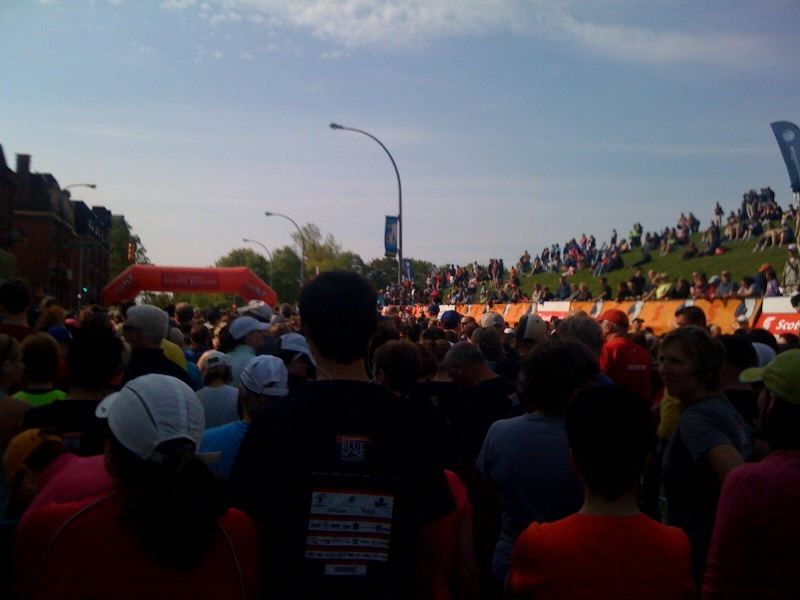 The crowd for the 10k was amazing – 2320 participants! The Zumba people led a warm-up and got the crowd going. A highlight of the day was when my friend (from Junior High, but now lives in Bridgewater) Deanna, who was running the half, spotted us and came over for a pre-run hug! One of her friends took a photo of us together which I hope to get a copy of at some point. Before we knew it, the starting gun went off! Now pushing a double stroller with daughters who are probably over the stroller’s weight limit among that many people is not for the faint of heart – especially when you try to be respectful of others. It took us over a kilometre before we were at a point where we could run at our own pace, rather than that of others. Even then, there were many times we would have liked to pass people, but there just wasn’t room. Crossing the bridge was beautiful with the sun shining on Halifax Harbour. The race course took us past D’Arcy’s cousin Sheila & her husband Peter’s house where they were sitting on their front porch drinking tea and cheering the runners on. We yelled to them and they cheered and waved for us as we passed by each way. That gave us some much-needed (especially at that point!) extra momentum! We had to walk again going back up the Bridge, but took turns with the girls which made it much easier. Coming down the other side, we knew there was less than 2km left to the finish, so we dug deep. Part way down Brunswick Street, we heard sirens behind us and after a moment of wondering if someone was hurt, realized it was the police with the marathon pace car & bicyclist, asking people to move out of the way for the lead marathon runner to come through on his way to the split time. We got our chips clipped off our sneakers, and the volunteers were kind enough to give the girls our medals. 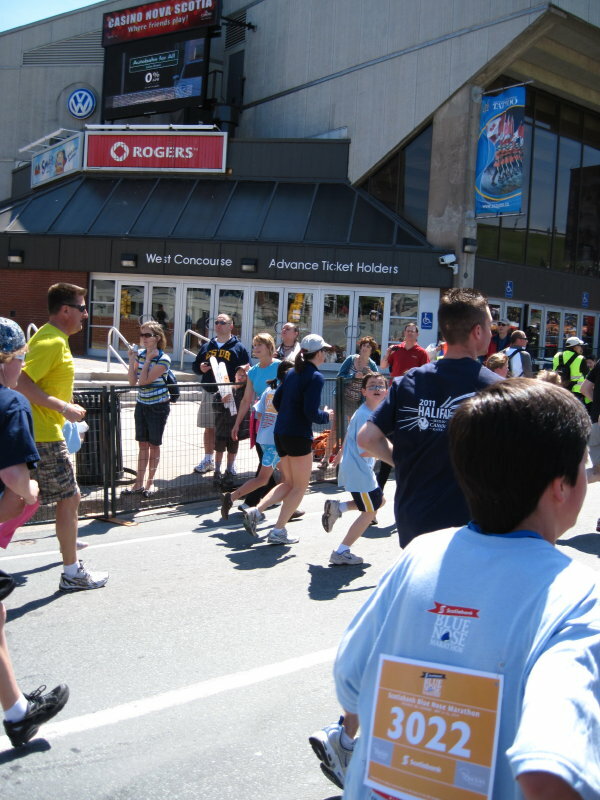 We headed into the Metro Centre and around through, in case we had time to catch the boys coming across the finish line. 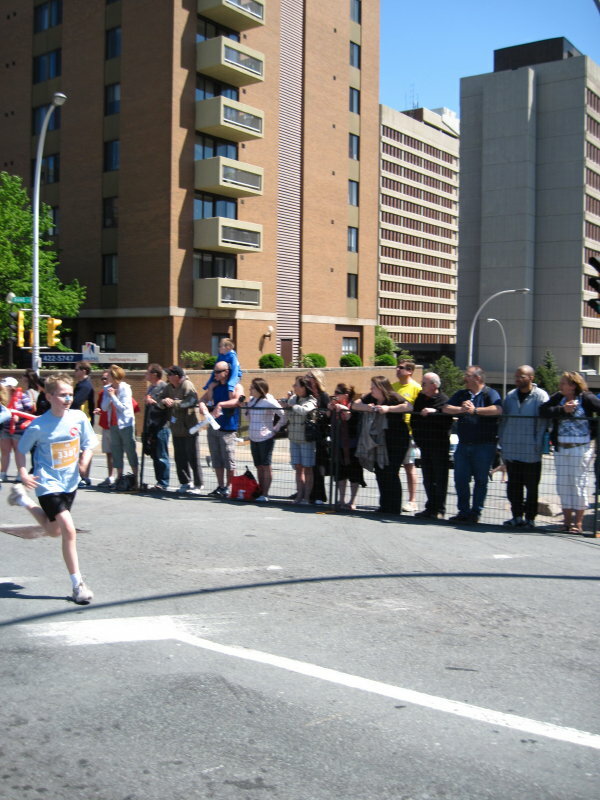 We weren’t sure how long it would take them or if we had missed them, when D’Arcy yelled to me, “There’s Alex – he’s coming through!” As I turned to look, D’Arcy told me to look the other way; Alex was sprinting and was almost across the finish line! We went inside, met up with Evan, and shortly after Alex & Erin found us. We all told our stories and eventually Erin went up to watch the finish of the half and the full and we went back to the hotel for a swim and to pack up. The boys were SO proud of themselves and had a lot of fun running the race. They both said that they didn’t feel they were able to run as well as they had the day before and each had to stop and walk a short time. As it was, out of 1405 participants, Evan finished 106th with a time of 24:54 and Alex finished 436th with a time of 30:46. D’Arcy and I came 1205 and 1206 out of 2320 participants with a time of 1:02:47 and 1:02:49 respectively. Not too shabby, considering we were pushing over 75lbs of daughters. I’m especially pleased because even though I run, I don’t consider myself a “runner”! The next running event we hope to participate in is the Not-Since-Moses Run in Five Islands in August. I hope my calves feel better by then! It’s a GORGEOUS day in Halifax today. 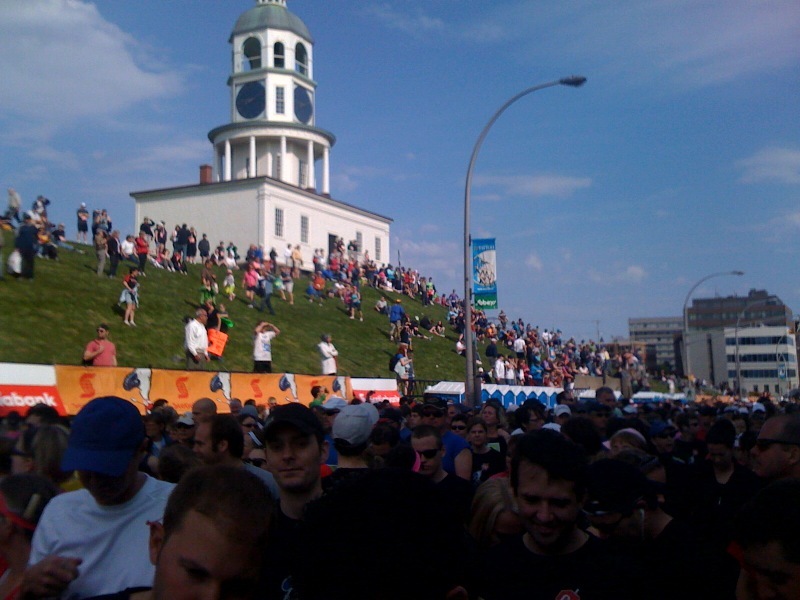 In fact, the weather has never been so good for Bluenose Marathon weekend! This is Blue Nose Marathon weekend. 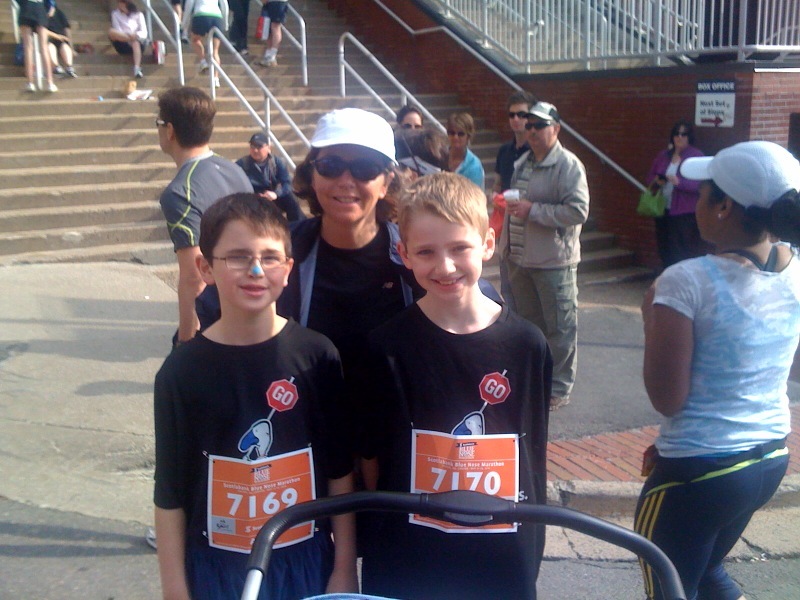 Yesterday, Evan & Alex run the Doctors’ Nova Scotia 4.4km Youth Run. 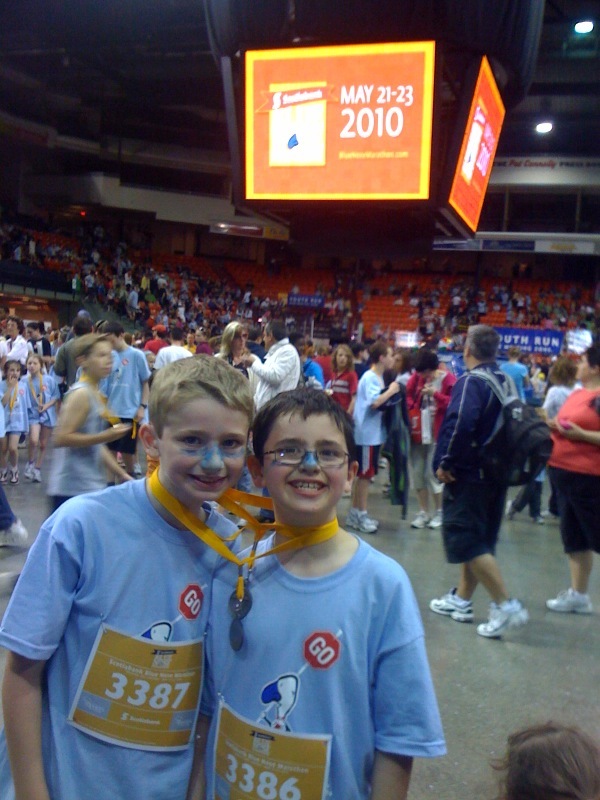 They did great – Evan finished in about 18 minutes and Alex finished in about 23 minutes. Today, D’Arcy & I are running the 10k and Evan & Alex are running the 5k. 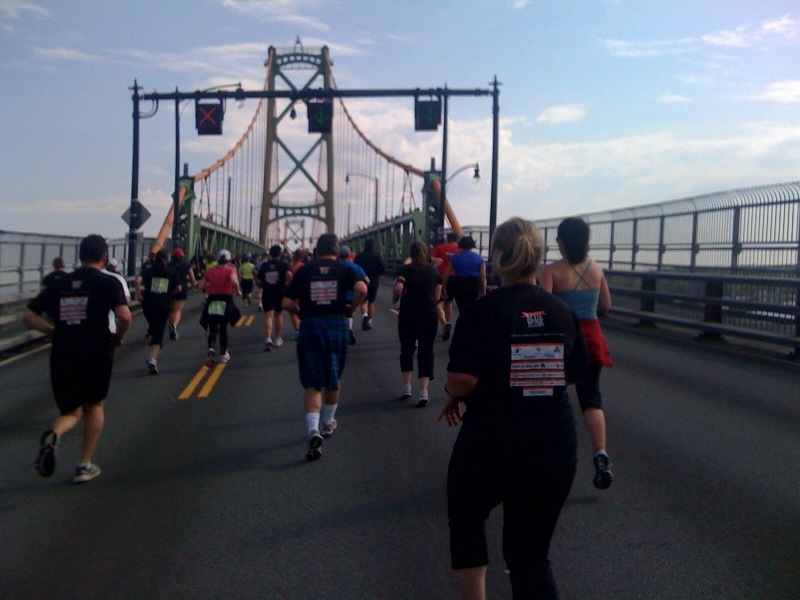 I’m really looking forward to running over the MacDonald Bridge! Will post later and let you know how we did!! We welcomed a new guest yesterday, one who has requested a long-term stay. Probably until fall, but her departure date has yet to be determined. 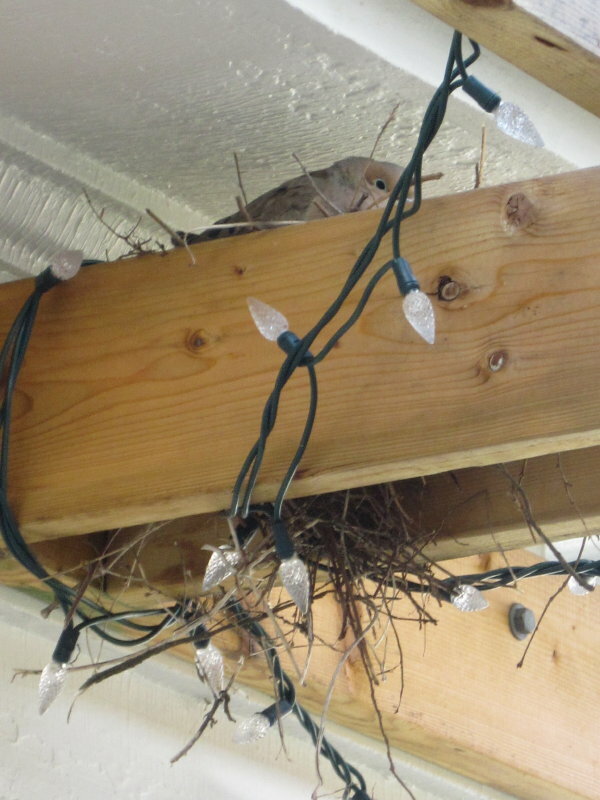 Welcome to “Lollypop”, a mourning dove who has built a nest in our pergola, just under the eaves of the house. Let it be stated for the record, Lollypop, that should you turn out to be a nuisance, (whether it be by unnecessary noise or mess), you may be asked to leave! Did you know that it’s estimated that as many as 25 million people in North America can trace their roots to Nova Scotia? There are so many fantastic links on the new Nova Scotia Tourism Website, but one I have just discovered and have been having fun with is the link to search out your family roots: www.novascotiaroots.com You just type in your family name, and it will show you where your ancestors may have lived. According to the Department of Tourism, the new website is a combination trip planner and genealogical research tool, designed to allow roots travelers to collect specific facts about their families along with practical travel information such as accommodations, attractions, and dining before they set out. The core of the site is a database containing 50,000 surnames going back 200 years or more, a million birth, death, and marriage records, and information on 27,000 locations.